Out of the need to de-stash, these mitts were born. I love this project because it really doesn’t take much yarn at all. If you’re super short on yardage, why not use up 3, 4, 5 colors at once? 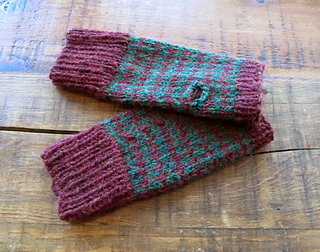 These fingerless mitts are knit in the round with a basic colorwork pattern alternating with solid stripes of color. This pattern is highly customizable and can be knit up with any worsted or aran weight yarn. Size 7 double pointed needled. • Blocking these mitts will quickly smooth out any bumps and inconsistencies that may occur. • You can easily make bigger or smaller mitts by adding or subtracting CO stitches. Just make sure you start with an even number.